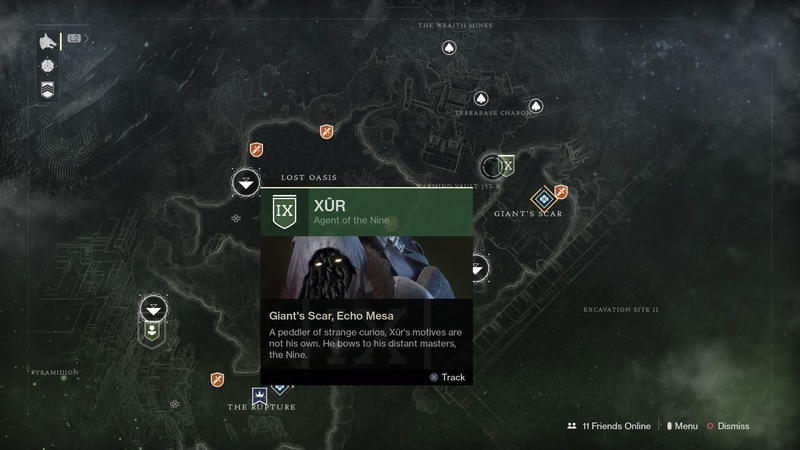 This week, Xur is on Io.Fast travel to Giant’s Scar and head straight through the Cabal base. Xur is in the back left corner inside a cave in this drill area. You can mark his location on your map. This week, Xur is selling the Merciless Fusion Rifle for 29 shards. The Lucky Pants Hunter leg armor is available for 23 shards. You can get the Mask of the Quiet One Titan helmet for 23 shards. And finally, the Starfire Protocol Warlock chest armor for 23 shards. The Merciless fusion rifle is an excellent power weapon that speeds up charge time after every non-lethal hit. This perk makes it a great weapon for quick damage output on bosses, so it’s a weapon you’ll definitely want to pick up if you don’t have it yet. Lucky Pants increases Hand Cannon ready speeds and ups the initial accuracy. While Hand Cannons aren’t currently in a great place right now in Destiny 2, these can help make them a little more viable. With new weapons and a new sandbox balance update coming in just over a week, it might be worth picking these up just to prepare for the possibility that they become really useful.. Mask of the Quiet One is a great all-purpose exotic helmet, with a bonus for running a void subclass. Anytime you are damaged, it will grant additional melee, grenade, and class ability energy, so getting hurt actually decreases your cooldown times. In addition, any kills with void abilities will trigger health regeneration, so it helps make the Sentinel even more powerful. This is definitely worth picking up if you don’t have one yet. Starfire Protocol will grant an additional fusion grenade charge to Warlocks, in addition to fusion grenade kills granting rift energy. Warlocks excel at shifting energies and light around, making use of all of their abilities to charge other abilities. This exotic isn’t quite as good as some other Warlock choices, but if fusion grenades receive a buff soon, it might be nice to have this one in your back pocket. Just this week, Bungie held the second of three live streams set to reveal details about the Curse of Osiris expansion. The first stream teased more about the Curse of Osiris Raid, and allowed us to finally release our playthrough of the first campaign mission. While we only showed the first mission we did manage to finish the whole campaign and provided our spoiler-free impressions of the story, location, and characters that players will encounter in Curse of Osiris. The second stream showed off the activities we’ll undertake on Mercury, and we have gameplay and our impressions of some of those activities. We’ve also got a series of Destiny 2 guides, including an endgame guide for after the campaign, a step-by-step Raid guide, and a guide on how to trigger all heroic public events.